Perhaps the most controversial aspect of valuation is the attempt to ascribe a financial value to a human life. Understandably, for ethical, religious or philosophical reasons, many people oppose the valuation of something commonly perceived as priceless, and argue that no monetary figure could possibly compensate entirely for the loss of a life. Despite the reluctance of some, determining the value of a life is necessary for policy makers and those involved in health and safety. As resources are finite and not every premature death can be realistically avoided, decisions in improving public health through medical procedures or safety regulations are being made. For example, this information is regularly used by the Department for Transport to review the cost-effectiveness of road safety schemes undertaken by local authorities and the Highways Agency. Without this information it may be difficult to target spending and resources effectively. The concept of placing a monetary value on a life is not new; old Anglo Saxon law described the “wergild” or “bode” - a sum of money which was to be paid to the family of a murder victim by the perpetrator. A person’s “wergild” was based on their wealth, and would therefore increase throughout the lifetime of an individual as they gained land and possessions. If the perpetrator was unable to afford this sum then they were sold into slavery or sent into exile. Both the Bible and Koran outline similar concepts on compensation to be paid to family members of those murdered. In recent decades, increased demand for information on the value society is willing to put on a human life has led to development of various methodologies. The most common method used by organisations for representing the value of a life is the Value of a Statistical Life (VSL). The VSL aims to reflect the amount of money that a person or society is realistically willing to pay to save one human life. “One human life” in this context relates not to any specific person’s life, but an anonymous life (e.g. 1 life in a million) hence it being a “statistical” life. Although many would argue that the value they place on their life is infinite, our personal decisions reveal that this is not the case. There are limits to the amount we would pay for marginal increases in safety (e.g. for expensive safety features in cars), and increases in occupational risk of death are often accepted if the monetary compensation is substantial enough (evidenced in the existence of “hazard pay”). As there is no established marketplace for a human life, economists must determine the value of this indirectly through a range of techniques, which often produce significantly different values. One very simple way of measuring VSL, and one which is commonly used, is to express this as the total potential earnings of an individual. This is known as the human capital (HC) approach and is useful in estimating future earnings which may result from health or safety improvements which extend lives, for example improvements in workplace safety. When calculating potential total future earnings, several assumptions must be made based on age, life expectancy and approximate increases in future earnings which may occur. This makes it possible for relative impacts of different interventions on specific groups to be made. For example, the relative benefits of a health intervention aimed at saving the lives of young children as opposed to the elderly. Although this method has the advantages of being relatively easy to calculate and enabling comparisons between different groups of people, it is not without its issues. Income inequalities between groups can result in problematic valuations using this method, for example, a male life is likely to be valued much higher than that of a female life. A study into Present Value of Lifetime Earnings (PVLE) revealed this discrepancy, with the PVLE of males aged 20-24 estimated at $1,517,045 in comparison to $1,085,188 for females aged 20-24. Furthermore, groups with low potential earnings such as the long-term unemployed or those with severe disabilities are likely to have a VSL of near zero when this method is used, with no bearing on the value they place on their own lives. As this method does not consider the intangible factors which dictate the value people place on their lives it can only be considered a basic tool for determining VSL. A similar concept to the human capital approach is the legal concept of “pecuniary losses,” which relates to the quantifiable financial losses such as loss of income due to time taken off work or medical costs. For example, the families of people unlawfully killed may be able to recover the pecuniary loss of income which they would otherwise have received. This contrasts with “non-pecuniary” losses which are generally considered more difficult to quantify and value. Non-pecuniary losses relate to non-material losses which result in reduced enjoyment in life such as pain and suffering. Contingent valuation is a more recently developed method, which involves asking people how much value they place on their lives. Studies using the contingent valuation method are more complex than a straightforward question of “how much do you value your own life?” and generally work through a series of “bids”. Participants “bid” on how much they would be willing to pay for varying improvements in risk of death (e.g. from a 5% risk of death to a 1% risk of death) until their maximum willingness to pay (WTP) is determined. Conversely, participants may be asked how much they would need to be paid in order to accept increases in likelihood of death. Unlike the human capital method, this has the advantage of taking into account intangibles such as leisure, well-being and social interaction which have an important bearing on how much people value their own lives. A difficulty often encountered when conducting contingent valuation studies is the “protest bid,” where a participant will place upon their own life an unrealistically high figure. If 100 participants in a study claim their life is worth around £1-2 million but one insists theirs is worth £1 trillion, then this will introduce a significant bias to the data. The problem of the “protest bid” is not specific to studies on VSL; many contingent valuation studies on the environment have also encountered this, finding respondents who believe it is unethical to value nature will often state a near infinite WTP. To account for this problem, it may be necessary to disregard these bids or use the median as opposed to the mean when calculating an average. Clarification of the concept of a VSL and how it makes possible difficult trade-offs for preventing fatalities may also help reduce the risk of “protest bids”. Another drawback of this method is the difficulties most people have in understanding varying levels of risk. If a study asked respondents how much they would need to be compensated to accept a 0.5% increase in risk of death over a 0.1% increase, how many respondents would have accurately perceived the differences between these levels of risk? Would the results of a study where many respondents did not fully understand these differences produce valid data? 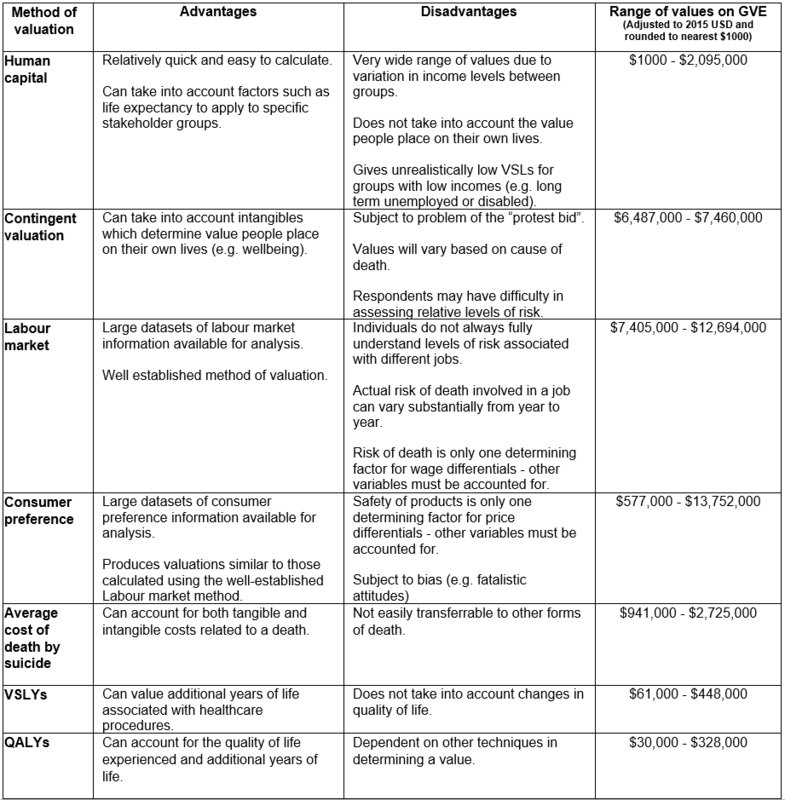 When using the contingent valuation method, the cause of death can also impact the VSL, as participants will (understandably) be willing to pay more to avoid certain causes of death. For example, participants are likely to be willing to pay more to avoid dying of cancer or due to terrorism than they would to avoid a less painful or traumatic cause of death. A study conducted in Italy and the Czech Republic indicated that the value of a statistical life of an adult stands at around €4 million, and the value of a statistical life of a child around €4.6 million. One commonly used way of calculating VSL is to look at wage differentials for jobs which carry different risk of injury or death (an example of the revealed preference method). Wage differentials occur for many reasons. A job may have better working conditions, more flexible working hours or opportunities for career advancement. Some of this differential can be explained by differing levels of risk - in general, a riskier job will carry a wage premium over a similar job which carries a smaller risk (evidenced in extreme circumstances though the existence of “hazard pay”). This wage premium can be used to estimate the value that a person places on their own life. For example, if a worker is willing to accept a 1% greater risk of death in return for a £1000 wage premium, it can be assumed that they are placing a value on their life equal to £100,000 (£1000 x (1 ÷ 0.01)). Research by U.S. Congress economist Ike Brannon has found that VSLs calculated using analysis of labour markets show a very large variance - from $0 to over $100 million per statistical life, although a widely accepted study published in 2011 indicates a VSL of around $7 - 12 million. This figure is substantially higher than typical VSLs calculated using different methods. A limitation in this method is that there is often a divergence between actual and perceived risks of death. It is unwise to assume that individuals will be aware of or understand fully the risks associated with every job. This can be problematic, as it means a job considered to be dangerous can have a wage premium higher than a job considered to be comparatively safe, but which in actuality carries a far higher risk of death or injury. The divergence between perceptions of occupation risk and reality also shows variation by group, with young and ethnic minority workers less likely to perceive this accurately. Furthermore, the relationship between risk and wages is not linear - the increase in wages seen from an increase in risk from 0.1% to 0.2% is likely to be much higher than if risk increased from 1.1% to 1.2%. This means a 50% increase in risk will not necessarily correspond with a 50% increase in wage premium. Further uncertainties can occur when calculating the actual risk of death or injury associated with a given job. In many industries (such as mining or fishing), infrequent but large accidents mean that death rates can differ substantially from year to year. For example, in the USA, 16 coal mining fatalities occurred in 2014 compared with 48 fatalities in 2010. Additionally, some studies which have used this method have calculated risk based on industry or company rather than occupation, meaning the risk of death of a fisherman is assumed to be the same as that faced by an accountant working for the same company. These problems highlight the need for studies using the labour market method to properly aggregate data and control for the various factors besides risk which dictate wage differentials. In much the same way as a worker’s WTP for a safer work environment reveals the value they place on their own life, consumer decisions where safety is a factor can also be used to infer VSL. For example, if a consumer is willing to pay £1000 for car airbags which decrease their likelihood of death by 0.5% then it could be said they place on their life a value of £200,000 (£1000 x (1 ÷ 0.005)). Research into the willingness to pay of consumers for airbags has estimated that the value of a statistical life is between $7 - 13 million. Similarly to how danger is just one factor determining wage differentials, the safety of a consumer product is one of many attributes which influence its cost. Even products which are bought almost entirely for safety reasons will have other characteristics which will increase or decrease a consumer’s WTP for it. For example, two life jackets may offer different levels of safety but may also vary in comfort, style or build quality which consumers will take into account when making a purchase. Therefore it is important that the extent to which the perceived safety of a product impacts consumer decisions is accounted for. One aspect of the VSL is the tendency for the value to vary depending on income and culture. Although variances in VSL within high-income countries due to these factors is well documented, the cost and complexity of studying the VSL means comparatively little information is available for low-income countries. What information does exist reveals a very strong correlation between VSL and GDP per capita, with people from low-income countries having VSLs consistently lower than those from high-income countries. A consumer preference study in Sierra Leone highlighted this discrepancy. This study observed transport mode preferences of travellers crossing the body of water which separates Freetown (the capital of Sierra Leone) and the nearby Lungi International Airport. Through analysis of the costs, convenience and risk of death associated with each available transport type (ferry, helicopter, hovercraft, and water taxi), an estimate could be made as to how much people valued their own lives. This found that the VSL of an African traveller ($577,000 per statistical life) was far lower than that of a non-African traveller ($924,000 per statistical life). The authors of the study concluded that much of this discrepancy could be explained by personal economic circumstances. Those with higher earnings tended to have high VSLs, and were far more likely to opt for the safest transport options even if this meant spending more or travelling for longer. They also identified cultural differences as a significant factor, in particular the more fatalistic attitudes prevalent in African travellers. Fatalistic attitudes contribute to low VSLs, as a belief that major life events cannot be controlled means far less importance is given to personal safety. Those with lower values of life tended to opt for the more dangerous transport types (helicopter, hovercraft and ferry) regardless of economic circumstances and perception of personal life-expectancy. All of the above methods of calculating a VSL are dependent not only on the value placed on a life, but on the risk of losing one. To better understand this risk, it is useful to have a standard unit of measurement which can be used to evaluate the average probabilities of sudden death. The micromort is a unit which represents this risk, with one micromort equal to a 1 in 1 million probability of death related to an activity (such as climbing a ladder), chronic risk (such as spending time in a dusty factory) or a given period of time. If climbing a ladder is associated with a 5 in 1 million risk of death, then it could be said that this activity carries a risk of 5 micromorts. This information can be used to evaluate the most cost-effective actions for reducing fatality likelihoods. A financial value of one micromort can be determined by dividing a VSL by 1 million. For example, a VSL of $7 - 12 million would indicate that the value of an individual micromort is around $7 to $12. If we were to use the ladder example, an intervention (such as providing the worker with a helmet) costing $7 which reduced the level of risk by 1 micromort could be said to be cost-effective. A common criticism of the concept of a VSL is that the age of an individual is often not taken into account. Most people would agree it is reasonable to suggest that the life of a new-born baby should carry a far higher value than that of a centenarian. In order to account for this, it possible to calculate the Value of a Statistical Life Year (VSLY). The VSLY aims to calculate the value of one additional year of life experienced, and is often used in cost benefit analyses regarding healthcare procedures. If a medical procedure which increases the life expectancy of a patient by one year costs £100,000 but the VSLY is calculated to be equal to £200,000 then it would be deemed cost effective. The value of an additional statistical life year due to medical intervention has been calculated at between $95,000 and $264,000. Although a medical procedure may prolong the life of a patient, life following this may not be enjoyed in full health or mobility. For example, a double amputation may save the life of a patient, but this would mean the additional years would be with a greatly reduced quality of life. To account for this, the Quality Adjusted Life Year (QALY) method has been developed. When calculating a QALY, each additional year of life is given a weighting from 0 to 1 based on quality of life. A year spent in full health is equal to 1 QALY, and a year determined to be spent at 50% health is equal to 0.5 of a QALY. Death is equivalent to 0. Therefore, if an operation were to extend the life of a patient by one year at 50% health, then it could be said 0.5 of a QALY was saved. If 1 QALY is equal to £200,000 and the operation cost £90,000, then this operation would be deemed cost effective because the value of 0.5 of a QALY (£100,000) would be valued higher than the cost of the operation (£90,000). A study by The Department for Health has valued one QALY at £60,000, although a general figure of £20,000 - 30,000 per QALY has been identified as the upper limit for treatments being deemed cost effective in the UK. In the US, a figure of $50,000 per QALY has often used to determine cost-effectiveness of treatments. Research indicates this is likely an undervaluation, identifying $109,000 and $297,000 per QALY as plausible lower and higher bounds respectively for a treatment being cost effective. A further method of calculating the value is a life is to look at the estimated cost of a suicide. A study by the Department of Health, Social Services and Public Safety put the total costs of 313 suicides at £539,330,400. This means that the average cost of a suicide in Northern Ireland is estimated at around £1.7 million. This figure includes direct costs (e.g. costs incurred by emergency services), indirect costs (e.g. lost economic output) and the intangible costs of death incurred by victims and their families such as pain, grief and suffering. Although this value takes into account a range of factors, it is limited in that it is specific to suicide and therefore not easily transferrable to the costs of other forms of death. It also fails to take into account the value placed by individuals on their lives, instead valuing only the impacts of death. These limitations mean that this method is rarely used to value life outside of studies or projects specifically relating to suicide. The table below summarises a range of values relating to human life which have been uploaded to the Global Value Exchange. For comparability, these valuations have all been adjusted for inflation, converted to USD and rounded to the nearest $1000. Advantages and disadvantages of each method have also been outlined. Although the concept of placing a monetary value on a life is controversial, the ability to do so is useful for making informed and rational decisions on resource allocation. Despite the (often large) variations in values, the improved methodologies used in studies and extensive debate within academic and policy-making circles has recently begun to narrow down the accepted range of values. Recent research using labour market data has narrowed down the estimated range of a statistical life year from $0 - $30 million per statistical life, to $7 - $12 million per statistical life. This has been achieved through more accurate assessment of panel data and improved controls for errors and inconsistencies in data sets. This figure is very similar to the estimated $7 - 13 million per statistical life determined from consumer preference data relating to airbag purchases. The figure of $9.2 million per statistical life recommended by the US Department of Transport for use in internal analyses also falls within this range. The increased practical utilisation of this information is also promising, with government and private agencies regularly using this to evaluate relative benefits of infrastructure projects, safety measures and healthcare procedures.